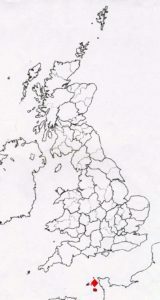 ‘The islands on the coast of Normandy subject to the crown of Great Britain’. 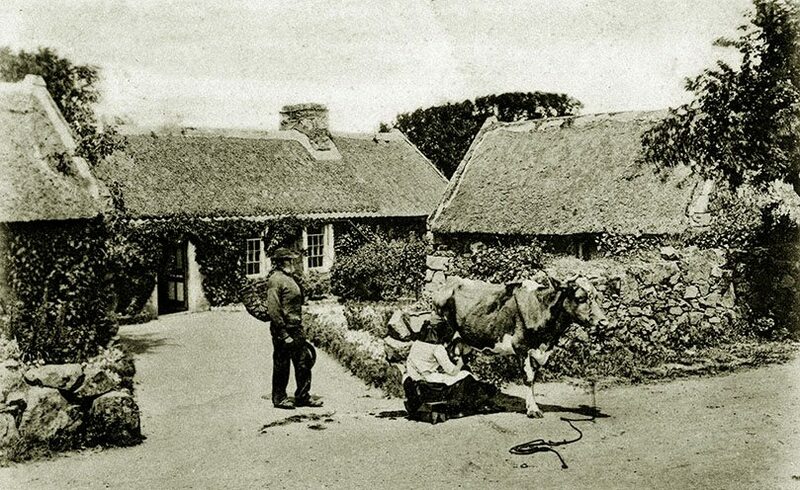 Guernsey, Jersey, Sark and Alderney, the four main Channel Islands; share a common thatching heritage. Amongst themselves and with their French neighbours; especially those in Brittany. 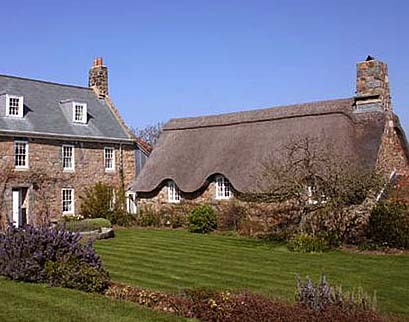 But the four island’s thatching also have links to mainland Britain. Today the islands still have a few thatches, and happily there has been a revival in the craft over the last few years. 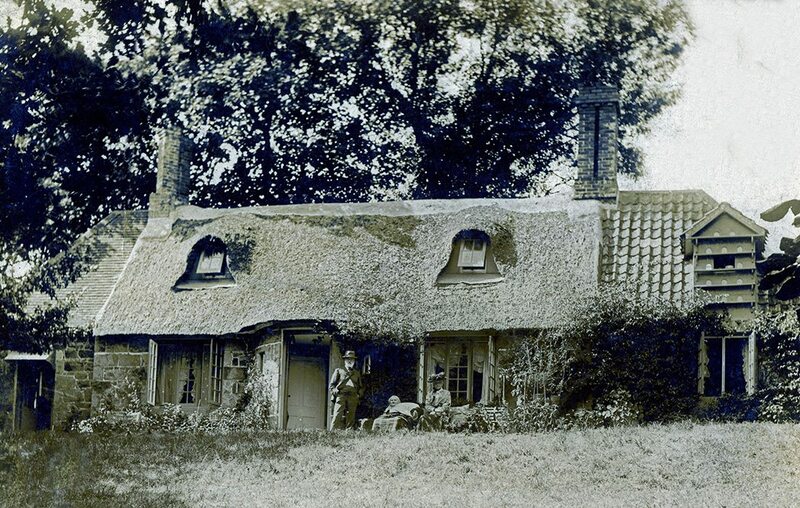 But until the late nineteenth century, thatch was the main roof covering hereabouts. 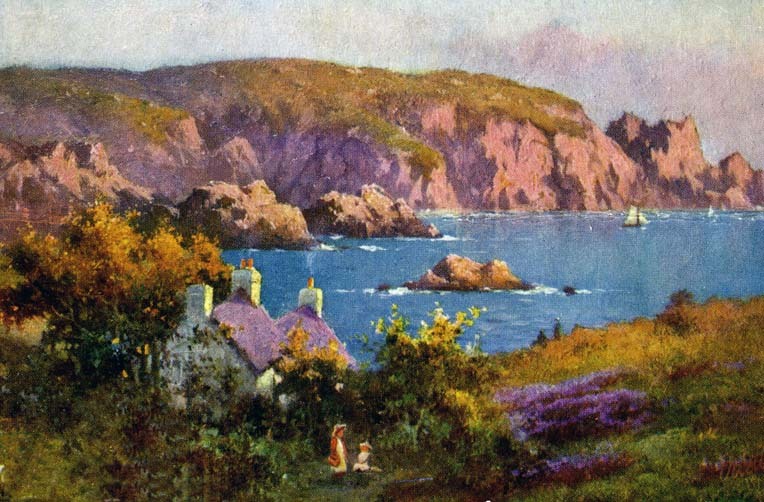 Moulin Huet Bay, Guernsey… The artist in this Edwardian image has shown some thatch, in an idyllic situation. 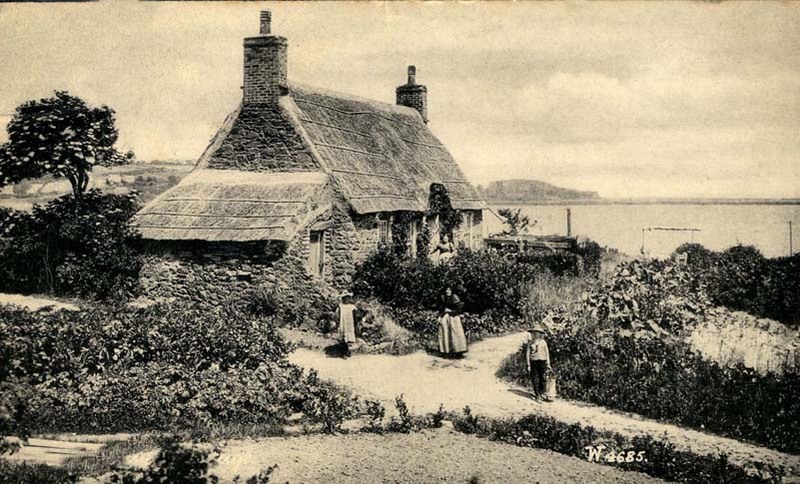 A 1906 visitor to the island, noted a ‘great many’ thatched cottages near the coast. 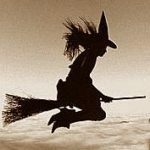 ‘Many however are being modernised or replaced’…. 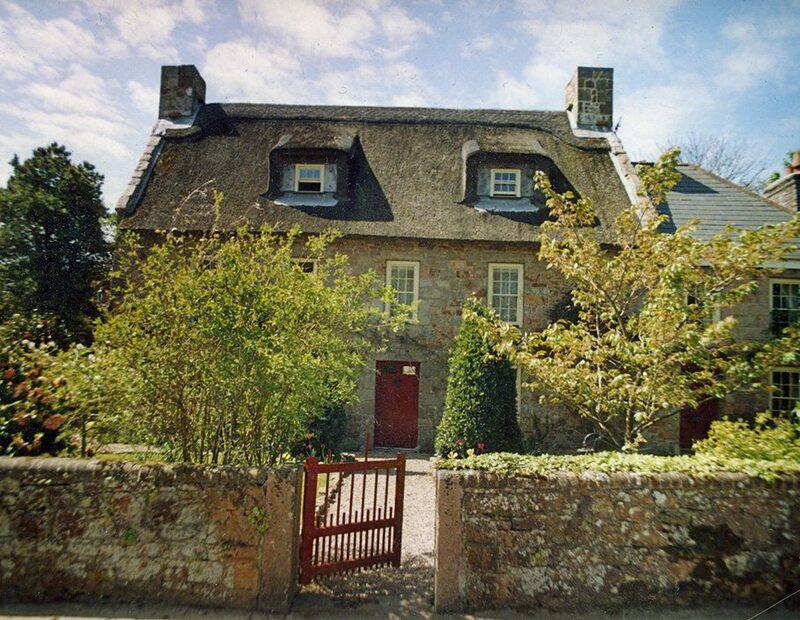 Historically more than one thatching material was used; ‘Grass’ being supplied, for works at Mont Orgueil castle on Jersey; in 1613 and 1635. This is almost certainly the marram grass, still found on the nearby coast. A little earlier, in the 1590’s, thatchers were employed, on Guernsey; ‘Repayring and fortifienge the southe parte of the Castle Cornett’. They worked for seven pence a day; the same as tilers and slaters. In 1610 more works were carried out at the castle; with sixteen shillings worth of reeds being purchased. 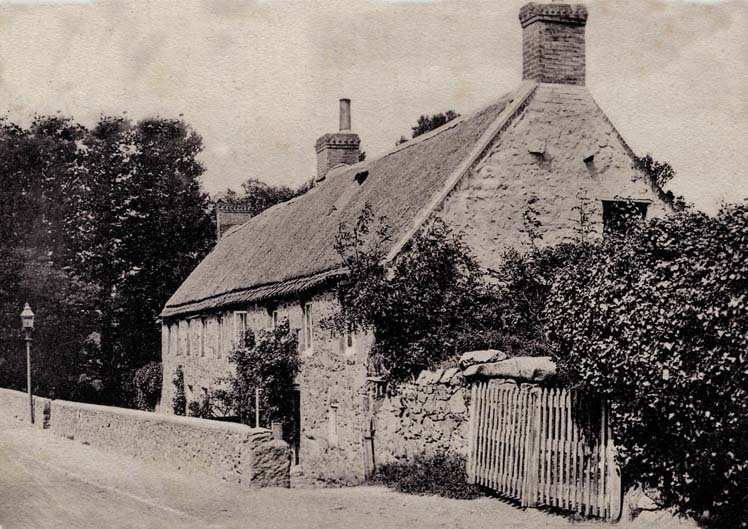 This was for thatching the timber store house ‘it being all decayed’. Six shillings was paid for this work; the rate being a shilling day. 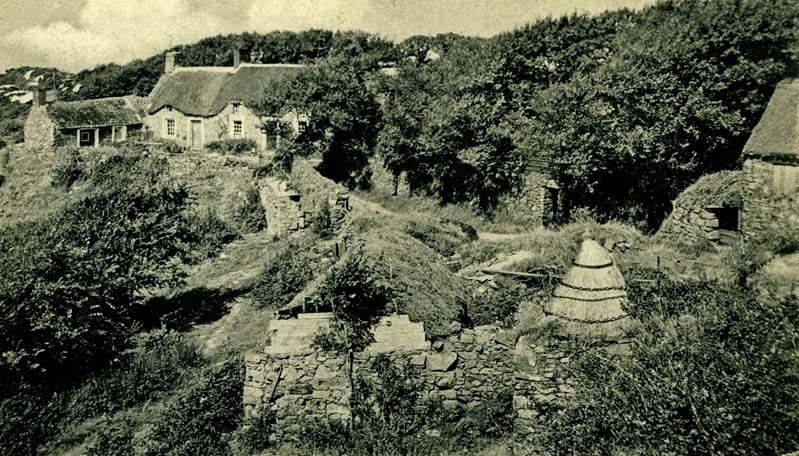 The fire risk, to urban thatch in 1683, forced the States of Guernsey to order ‘that no houses within the barriers of the town should be thatched or continue to be covered with thatch’ in St Peter Port. The worthies in Jersey’s St Helier followed in 1715. Around this time the Governor of Alderney also tried a ban. Not on the craft but on the annual springtime custom, of running through the streets with blazing straw ‘brandons’; this being a danger to the many thatched houses in St Anne’s. As with other areas using combed thatch, it’s neatness was admired. The Jersey writer Philippe Falle, stated with pride, in 1694; ‘France and England supply us with lime…. ; and the latter with blue slate… But this coming pretty dear, we must for the most part be contented with thatching; which is done with well chosen wheat straw, as little bruised as possible, laid on so artificially, bound so firm, and cut so smooth and even, that the work not only looks well to the eye, but will resist a storm of wind, better than I have observed common tyling to do in England’. 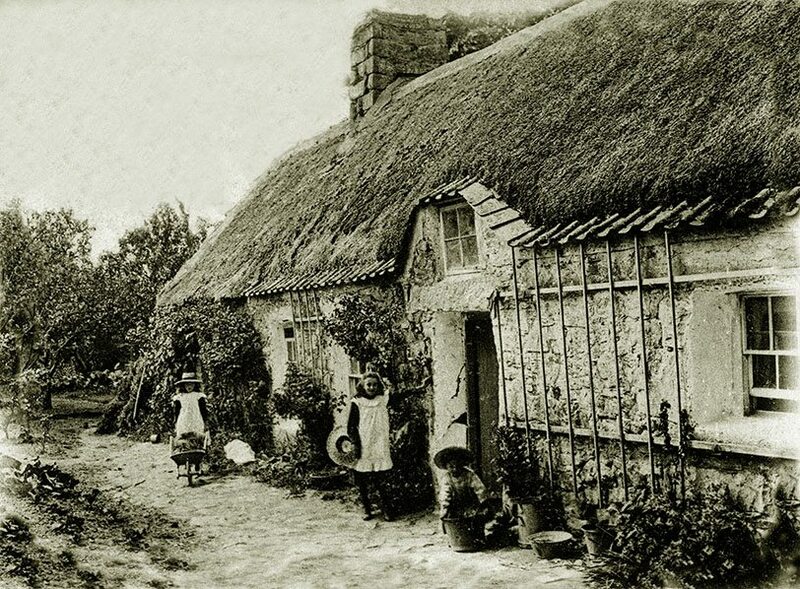 It seems from old photographs, that a traditional thatched roof, consisted of combed cereal thatch; usually tied on with straw or rushes; with stone gables acting as a wind break. The ridge was either of turf, or more usually, white loess; a clay common to all the islands, probably mixed with lime. 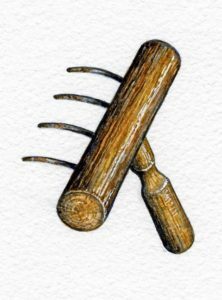 Spars and other wooden fixings were sparingly used, due to a shortage of suitable timber. 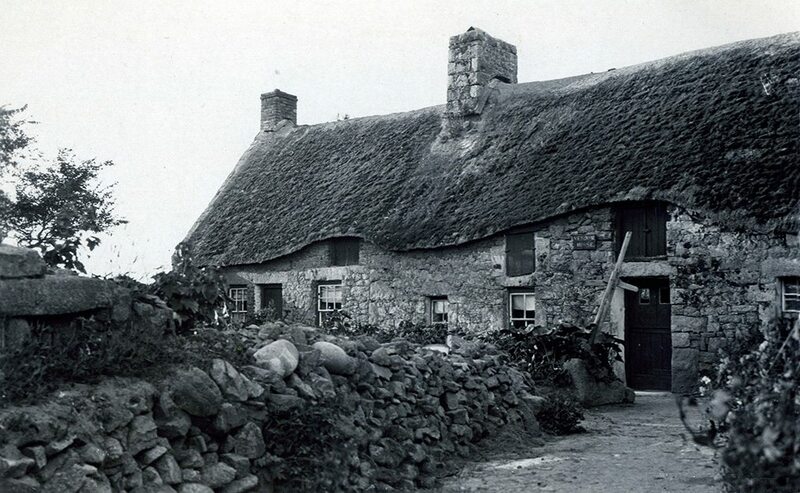 An historic problem faced by many island communities, over the whole length of Britain. 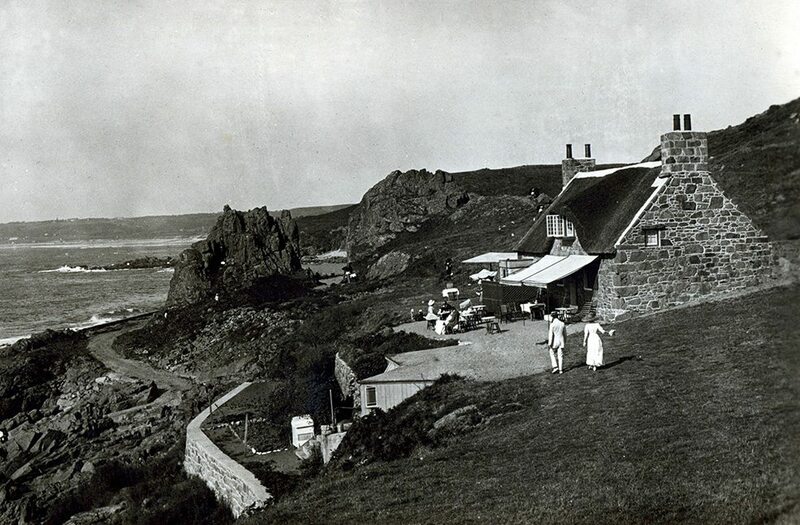 On Jersey… Above, a 1920’s tea rooms at Corbiere. With a new thatch and a shockingly white ‘loess’ ridge. Below is a modern roof in water reed, topped with a cut block straw ridge. 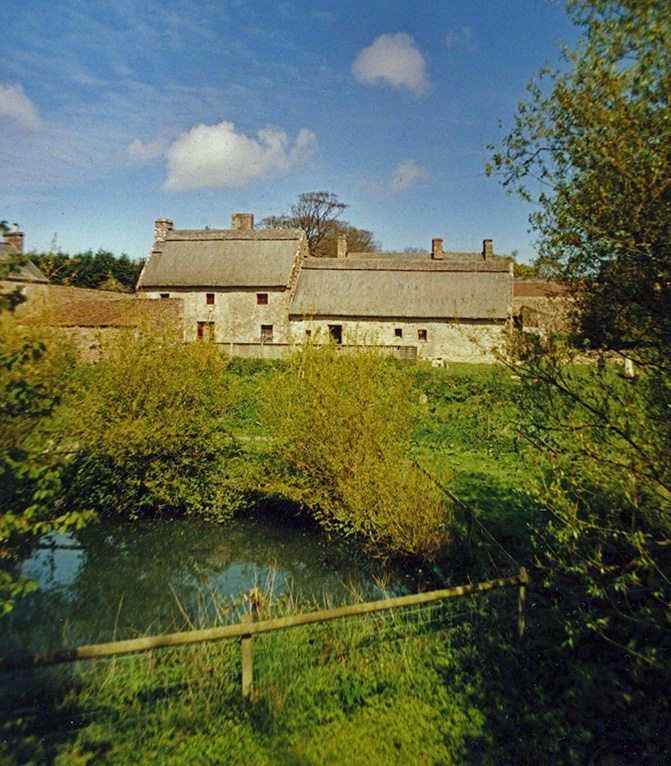 The left hand image shows the restored thatch at Les Caches Barn. 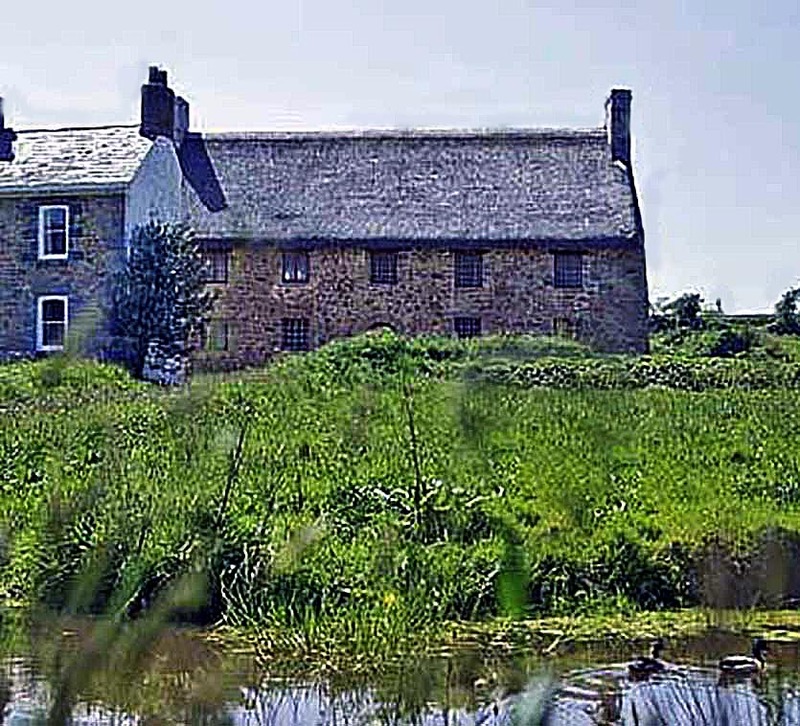 A property in the care of the National Trust for Guernsey. The image above shows modern water reed work, in St Martin’s Parish. Tile and slate roofs, being much thinner than thatch, have left these protruding drip stones a little way up the chimney, on many old Channel Island homes. 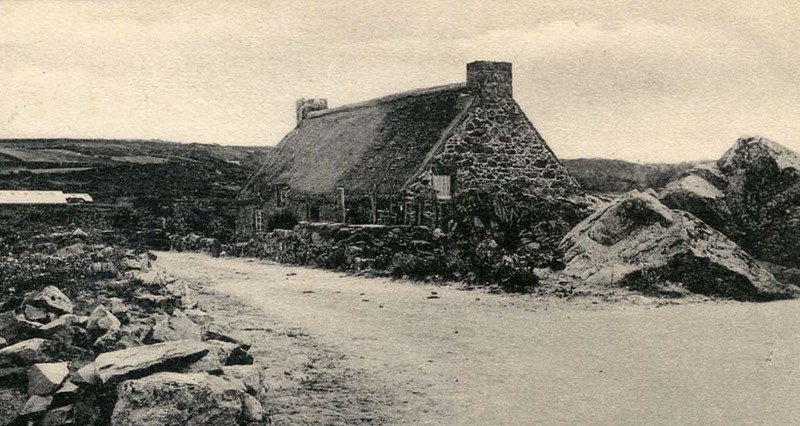 Showing the former widespread use of thatch.